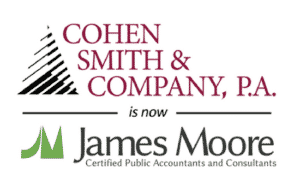 Cohen, Smith & Company Has Joined James Moore & Co.
Home/Cohen, Smith & Company Has Joined James Moore & Co.
James Moore & Co. (James Moore) is pleased to announce that the partners and employees of the DeLand CPA and consulting firm, Cohen, Smith & Company, P.A. (Cohen Smith), have joined James Moore, a regional CPA and consulting firm with offices located in Daytona Beach, Gainesville, Tallahassee, and now DeLand, Florida. Effective immediately, Cohen Smith will be known as James Moore. Established in 1986, Cohen, Smith & Company, P.A. has been providing accounting, tax, consulting and planning, business valuation and litigation support services to both businesses and individuals in Central Florida for over 30 years.